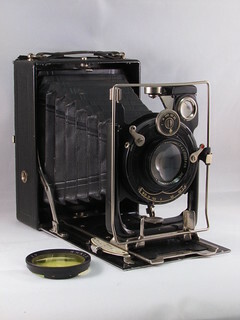 Franz Kochmann founded the Franz Kochmann Fabrik photographischer Apparate in 1921, and started production of folding cameras. The first reflex camera by Kochmann was offered in 1923. It was improved as the Enolde Reflex, launched in 1924. 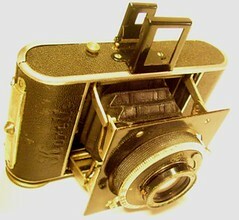 The same Enolde brand was used for various folding plate cameras, and later rollfilm cameras. The next main developments were the Korelle viewfinder folding cameras, issued in various formats from 1931 onwards. The company's major success was the Reflex-Korelle 6x6 SLR, released in 1935. In 1938 Franz Kochmann (who was Jewish) fled Germany and the company was siezed and renamed Korelle-Werk G. H. Brandtmann. At the end of World War II the production facilities burnt down when the city of Dresden was bombed severely by the Allies. The company temporarily restarted makeshift production in temporary facilities in 1945, before it was seized the same year by the Soviet Military Administration in East Germany. In 1946 the company was expropriated. In 1947 the resulting Korelle-Werke restarted production in new facilities in Dresden. However, the production of the pre-war Reflex-Korelle failed due to the inadequate production conditions. This was also the main reason for the company being taken over by the state-owned VEB WEFO in 1948. The VEB WEFO originated in the small enterprise "Lorenz, Inh. Max Pfau, Werkstätten für Feinmechanik, Optik und Spritzguss", since 1938 in Dresden. The Lorenz facilities were destroyed in February 1945. After the war, the company was seized and expropriated, and later emerged as the VEB Wefo, having about 60 skilled workers in 1948. The merger of VEB WEFO with the Korelle-Kamera-Werke was meant to better support the production of a 6x6 SLR. The Meister-Korelle, a development of the Reflex-Korelle, was launched by VEB WEFO in 1950. Technical shortcomings with the camera, e.g. with the film transport, however hindered production. As the Meister-Korelle was meant to be the production backbone of VEB WEFO, this meant there was no more reason for the company to exist as an independent entity. Both the production of the Meister-Korelle and the VEB WEFO itself therefore ended by the 1951 takeover by VEB Welta-Kamerawerke. According to Richard Hummel, VEB Kamera-Werkstätten Niedersedlitz took up production of the Meister-Korelle, however Gerhard Jehmlich (2009) rejects this, and states that KW tested the construction of the Meister-Korelle, but did not continue production. Instead KW started development of the Praktisix from 1952. No more than 2500 Korelle-cameras were produced between 1947-1952. This page was last edited on 2 June 2018, at 11:44.